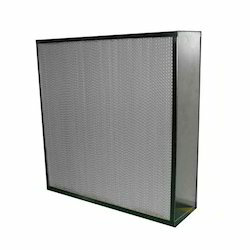 Leading Manufacturer of hepa filter mini pleat, pao/hepa filter integrity test, hepa filters, hepa filter and hepa ulpa filter leak tests from Faridabad. Voted as first among the best, we provide patrons with the superior quality of HEPA Filter Mini Pleat. 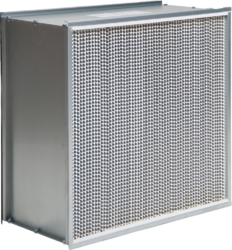 Manufactured by using latest machinery, the HEPA filter is known for its aluminium anodized with extruded type casting construction. Micro fibre glass paper filter media is used in the HEPA filter, for excellent filtration efficiency. Separators: Continuous Hot melt glue. Backed with the best and the upgraded version of machine technology at our end along with a skilled and adroit team of our company?? ?s workforce, we provide PAO Hepa Filter Integrity Testing Services. The services have been highly reckoned in the country in amongst our highly admired customers owing to their accurate and durable results yielded towards their completion. 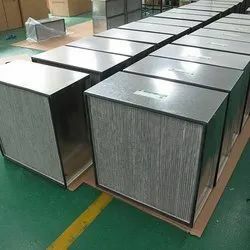 Filter Dimensions 24" x 24" x 12"
Voted as first among the best, we provide patrons with the superior quality of HEPA Filter Manufactured by using latest machinery, the HEPA filter is known for its aluminium anodized with extruded type casting construction. Micro fibre glass paper filter media is used in the HEPA filter, for excellent filtration efficiency. its many applications, including use in medical facilities, automobiles, aircraft and homes,air filter must remove (from the air that passes through) 99.97% of particles. the chances of potential pulmonary side-effects like asthma and allergies is a much lower with HEPA purifiers. HEPA filter is resistance to high temperature. HEPA filter is long lifespan. Usage: Air FilterFilter Medium Material: Fiberglass,Galvanized Frame, MDF Frame , ABS plastic Frame. We provides complete HEPA/ULPA filter integrity testing services for both the Pharmaceutical and Microelectronics industries. All filter integrity testing performed by madhav is executed in accordance with international standards. madhav is equipped to perform testing with both Di Octal Phthalate (DOP) and Poly Alpha Olefin (PAO) depending on your site?? ?s specific requirements. We participate in an annual intensive training on our Standard Operating Procedures written to conform to the current standards and Current Good Manufacturing Practices (cGMP) governing critical environments. Looking for “HEPA Filter Mini Pleat”?